Riyadh Elite wins Kora Thon Basketball 2018 title. In the semifinal game they beat Rebels 46-10, while LiNK beat Army 26-15. Later in the Final Riyadh Elite overcame LiNK 47-25. The Kingdom of Saudi Arabia will compete in all contests of the fourth edition of the Arab Women Sports Tournament (ASWT 2018), organised by Sharjah Women's Sports Foundation (SWSF) and taking place February 2-12 in Sharjah. Participating for the first time in what is the Arab region's largest women's sports competition, Saudi women's clubs will compete in the ASWT's nine disciplines of fencing, basketball, show jumping, table tennis, karate, archery, volleyball, athletics and shooting. Nada Askar Al Naqbi, Deputy Head of AWST's Supreme Organising Committee, Head of its Executive Committee and Director General of SWSF, said: 'The participation by Saudi Arabia in ASWT 2018 is a significant addition to the involvement of Arab women's clubs in the tournament. Everyone at Sharjah Women's Sports Foundation is delighted with their inclusion in the competition and welcomes all Saudi female players who will be participating in the forthcoming event.' Al Naqbi made reference to the great attention and care given by Saudi women's sports associations in developing the skills of its country's female athletes and in expanding the scope of their engagement in Arab and global sporting events. She added: 'In the Arab world, we have witnessed remarkable progress in women's sports and in the support of girls and women wishing to take part in competitive events. This heralds a promising future for Arab women as champions and lays the groundwork for them to clinch the most prestigious tiles in global tournaments, including the Olympic games.' Al Naqbi expressed a wish that Saudi sportswomen participating in the pan-Arab tournament would enjoy a high degree of achievement created through free competition with their counterparts from other Arab countries. 'We are proud of bringing together Arab female athletes in Sharjah for the fourth time,' she concluded. Prince Talal Bin Abdulaziz, President of the Arab Sports Council, Head of the Union of Arab National Olympic Committees said: "We are committed to our presence in Sharjah because of the attention and care that His Highness Sheikh Dr. Sultan bin Muhammad Al Qasimi, Supreme Council Member and Ruler of Sharjah, and Her Highness Sheikha Jawaher bint Mohammed Al Qasimi, wife of the Ruler of Sharjah, give to women's sports in UAE. The participation of Saudi delegations in AWST is in the interests of the Saudi government as it will help with the development of the women's sports sector and encourage players to participate in all competitions that will enhance their presence in the Arab region." Prince Talal added: "The UAE is a role model for women's sports in line with the government's efforts to empower women in all fields. We are working with HE Sheikha Haya bint Aziz Al-Khalifa, member of the Board of Directors of Bahraini Olympic Committee and President of the Women's Sport Committee, to provide the teams with the opportunity to participate in these sporting events." In April this year, AWST's Higher Organising Committee announced that SWSF had been endorsed by the Union of Arab National Olympic Committees as the official organisers of the fourth edition of the tournament. The committee also announced that it received confirmation from 15 countries that will sign for the event, including a number that will participate in its entire array of contests for the first time. The first edition of AWST was held in 2012 under the initiative of Her Highness Sheikha Jawaher bint Mohammed Al Qasimi, wife of His Highness the Ruler of Sharjah, Chairperson of the Supreme Council for Family Affairs and Chairperson of SWSF. 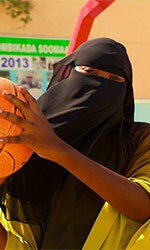 The pan-Arab tournament is held once every two years with the aim of furthering women's sports in the Arab region.